This diagram is somewhat hard to figure out but interesting. The horizontal axis is the century, from 1000 BC to 2400 AD (plan for the future). The vertical axis is the number of lunar impact craters with names (not letters). The purple circles show the number of craters named for people who lived in the indicated centuries - not the number of names given in those centuries! 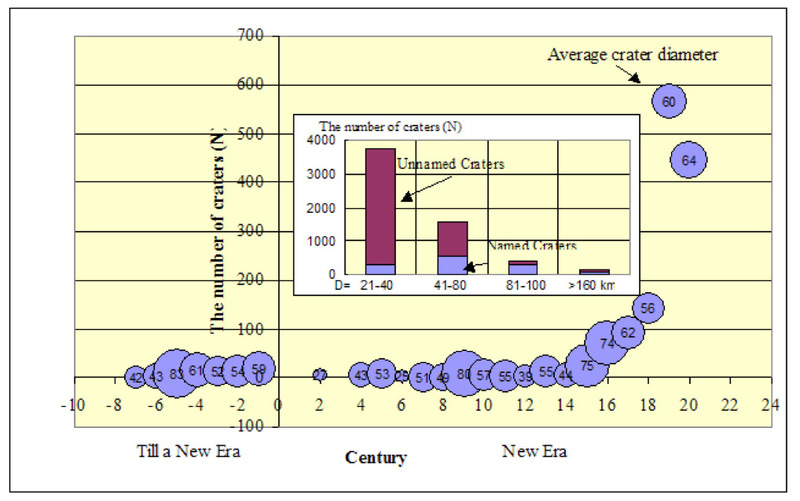 (The size of the purple circles and the numbers inside them show the average diameter of named craters of each century.) It appears that up until the 15th century only a handful of craters commemorate people each century. These include Plato, Alexander (the Great) and other Greeks who lived before the common era. The near lack of honorees for the first 400 years following 0 AD is indicative of a paucity of people leading scientific and philosophic lives. Since the 15th century the number of names given has rapidly increased, and these names were for contemporaries of the name-givers. During the 1800s (the 19th century) it looks like about 575 names were given, and about 450 in the 1900s. According to the IAU list only about 37 new names have been given so far this century, a number sure to increase when Indian, Chinese and Japanese names are proposed. And if anyone ever goes to live on the Moon the number will skyrocket. The insert graph shows how many of the craters in the indicated diameter ranges have names. Before you say, Oh my gosh, there are so many craters smaller than 80 km that we need to name!, remember that 7,056 craters are lettered and thus have designations that completely and unambiguously identify them. For much more about lunar nomenclature see the extensive info in the Moon-Wiki. This page was last modified on 13 October 2018, at 18:53.